Multirate filterbanks have found applications in speech processing, image processing, communications, and in the development of new sampling theorems. This paper explores the relationship between sampling theorems and multirate filterbanks in the linear canonical transform (LCT) domain. The sampling identity and the interpolation identity for bandlimited signals in the LCT domain are discussed and then employed to obtain a discrete-time implementation for bandlimited signals in the LCT domain from their multichannel samples. Furthermore, we relate the multichannel sampling for bandlimited signals in the LCT domain as well as the corresponding continuous-time LCT filterbank to the discrete-time LCT filterbank, which can lead to new sampling strategies for bandlimited signals in the LCT domain. Over the recent years, multirate filterbanks have found applications in speech processing, image processing, communications, radar systems, etc. [1, 2]. The structure of uniform filterbanks is generally composed of two parts: an analysis and a synthesis filterbank. Filterbanks help split a signal into two or more subbands, decimate each subband signal, and allocate bits for samples in each subband, which is the basic principle of subband coding for speech and image signals . Specifically, properties of speech and image signals to human perception are used in the coding process. In video signal processing, subband coding has been successfully applied for image compression [3–5]. Sampling is one of the most fundamental concepts in the area of digital signal processing, which serves as a bridge between continuous physical signals and discrete signals . Sampling theorems for continuous-time signals remain an active research field for decades. The classical Shannon sampling theorem has been extended into various generalized versions. Specifically, Papoulis has showed that a Fourier bandlimited signal can be recovered from several linear time-invariant filtered versions of the original signal, where each channel is sampled at a fraction of the Nyquist rate . In fact, the Papoulis' multichannel sampling theorem can be understood from the framework of filterbanks, which is independently developed in the discrete-time domain. In , Brown exhibits the resemblance between the Papoulis' multichannel sampling and the filterbanks and shows that the reconstruction process from multichannel samples is essentially a problem of designing a synthesis filterbank. In , Vaidyanathan and Liu further exploits the relationship between the multichannel sampling theorem and multirate filterbanks, and utilizes the framework of the filterbanks as a convenient tool for the derivation of the sampling theorems. In , the filterbank interpretation of multichannel sampling is presented more explicitly by using two identities, and the efficient reconstruction from multichannel samples is obtained. In another advance in signal processing, the linear canonical transform (LCT) has been introduced and used in processing nonstationary signals . The LCT is a linear integral transform with four parameters (a, b, c, and d). Although it is not very well-known, its special cases are widely applied in various fields under different names . The well-known operations such as Fourier transform (FT), the fractional Fourier transform (FRFT) , the Fresnel transform , and the scaling operation are all special cases of the LCT. The LCT is also applied in filter design, signal synthesis, pattern recognition, time-frequency analysis, holographic three-dimensional television, and many others [14–17]. Understanding the LCT can help gain more insight into its special cases and carry the knowledge gained from one subject to others . Moreover, a nonstationary signal (for example, the chirp signals) that is nonbandlimited in the FT domain can be bandlimited in a LCT domain. Therefore, many results in the FT domain have been extended to the LCT domain, such as uncertainty relations [18, 19], sampling theorems [20–26], sampling rate conversion , and multirate filterbanks . This paper generalizes the relationship between the multichannel sampling theorem and multirate filterbanks from the FT case to the LCT case. In section 2, some preliminaries about the definition of the LCT, the uniform sampling theorem, and the convolution theorem for the LCT are introduced. The sampling and interpolation identities for bandlimited signals in the LCT domain are presented in section 3. In section 4, we use these identities to obtain an efficient reconstruction method for bandlimited signals in the LCT domain from multichannel samples. Moreover, in section 4, we discuss the relationship between a continuous-time LCT filterbank, which is an interpretation of the multichannel sampling, and a discrete-time LCT (DTLCT) filterbank. Finally, conclusions are made in section 5. The derived results reveal a method for processing signals nonbandlimited in the FT domain but bandlimited in the LCT domain, and can be seen as a step towards generalizing the relationship between the multichannel sampling and filterbanks from the FT to other transforms that are special cases of the LCT. where M = a b c d is the parameter matrix and det(M) = ad - bc = 1. Two successive LCTs with matrices M 1 and M 2 equal to another LCT with the matrix M 3 = M 2 M 1; consequently, the inverse LCT is given by the LCT with parameters (d, -b, -c, and a). The LCT with the parameter matrix M = cos θ sin θ - sin θ cos θ reduces to the FRFT and to the FT when θ = π ⁄ 2. The LCT reduces to the Fresnel transform when M = 1 b 0 1 . Note that when b = 0, the LCT becomes a chirp multiplication. Therefore, only the cases where b ≠ 0 are considered. Without loss of generality, we assume b > 0 in this paper. A signal x(t) is said to be bandlimited to σ M in the LCT domain with the parameter M if X M (u) = 0 for |u| > σM. A nonzero bandlimited signal x(t) in the LCT domain has the following property: If x(t) is bandlimited in the LCT domain with the parameter M 1 = a 1 b 1 c 1 d 1 , then it cannot be bandlimited with another parameter M 2 = a 2 b 2 c 2 d 2 , satisfying the relationship a1 ⁄ b1 ≠ a2 ⁄ b2 . From this property, we can see that if a signal is nonbandlimited in the FT domain, then it can be bandlimited in the LCT domain . Therefore, the problems of processing nonbandlimited signals in the FT domain can be solved in the LCT domain. X T M u = L T M x ( u ) = L M x t ∑ n = - ∞ ∞ δ t - nT = 1 j 2 π b · e j d 2 b u 2 ∑ n = - ∞ ∞ x nT e j a 2 b nT 2 - j 1 b u nT = 1 T e j d 2 b u 2 ∑ k = - ∞ ∞ X M u - k 2 π T b e - j d 2 b u - k 2 π T b 2 . X ˜ T M w = L ˜ T M x w = 1 j 2 π b · e j d 2 b w 2 T 2 ∑ n = - ∞ ∞ x T n e j a 2 b nT 2 - j 1 b wn . Here, we use the · ˜ operator to indicate the discrete-time LCT domain. In , the convolution theorem for the LCT has been proposed, which is as follows: Define y t = x t ∗ M h t = 1 j 2 π b e - j a 2 b t 2 x t e j a 2 b t 2 ∗ h t e j a 2 b t 2 , where * is the conventional convolution operator for the FT. ∗ M denotes the convolution for the LCT with the parameter M. X M (u), H M (u), and Y M (u) are the LCTs of x(t), h(t), and y(t), respectively. Then, Y M (u) = X M (u) · G M (u), where G M u = H M u e - j d 2 b u 2 . Through the convolution theorem for the LCT, we can define a multiplicative filter G M (u) in the LCT domain, which is a linear time-variant system. In , the close analogy between sampling theorems and the multirate filterbanks is exploited, and in , the filterbank interpretation of multichannel sampling is given more explicitly by using two identities. The sampling and interpolation identities in  are suitable for bandlimited signals in the traditional FT domain. However, these identities are not applicable to signals nonbandlimited in the FT domain, but bandlimited in the LCT domain. In order to solve this problem, we introduce the sampling identity and the interpolation identity for bandlimited signals in the LCT domain in this section. H ˜ M w = H M w T s M , w ≤ π b . Sampling identity for bandlimited signals in the LCT domain. (a) Sampling block in continuous-time domain. (b) Sampling block in discrete-time domain. S 1 u = L M s 1 u = X u H u .
Y ˜ T w = 1 T e j d 2 b w 2 T 2 ∑ k ' = - ∞ ∞ ∑ l = 0 N - 1 X w T - l 2 π T b - k ' 2 π T s b H w T - l 2 π T b - k ' 2 π T s b e - j d 2 b w - l 2 π b - k ' N 2 π b 2 T 2 . S ˜ H , T s M w s = S ˜ 2 , T s M w s H ˜ w s , w s ≤ π b .
Y ˜ T w = 1 N e j d 2 b w s 2 T s M 2 ∑ l = 0 N - 1 S ˜ H , T s M w s - l 2 π N b e - j d 2 b w s - l 2 π N b 2 T s M 2 . Y ˜ T w = 1 N T s M e j d 2 b w s 2 T s M 2 ∑ l = 0 N - 1 H ˜ w s - l 2 π N b · ∑ k = - ∞ ∞ X M w s N - l 2 π b N T s M - k 2 π T s M b e - j d 2 b w s - l 2 π N b - k 2 π b 2 T s M 2 = 1 T e j d 2 b w s 2 T s M 2 ∑ l = 0 N - 1 H ˜ w s - l 2 π N b · ∑ k = - ∞ ∞ X w T - l 2 π b T - k 2 π T s M b e - j d 2 b w s - l 2 π N b - k 2 π b 2 T s M 2 = 1 T e j d 2 b w s 2 T s M 2 ∑ l = 0 N - 1 ∑ k = - ∞ ∞ X w T - l 2 π b T - k 2 π T s M b e - j d 2 b w s - l 2 π N b - k 2 π b 2 T s M 2 H ˜ w s - l 2 π N b - k · 2 π .
H ˜ w = H w T s M , w ≤ π b .
H LP M u = T s M u ≤ σ M 0 otherwise . H ˜ M w = 1 T s M H M w T s M , w ≤ π b .
Interpolation identity for bandlimited signals in the LCT domain. (a) Interpolation block in continuous-time domain. (b) Interpolation block in discrete-time domain. s t = ∑ n = - ∞ ∞ x nT δ t - nT = x t ∑ n = - ∞ ∞ δ t - nT . S T u = L T M s u = 1 T e j d 2 b u 2 ∑ k = - ∞ ∞ X u - k 2 π T b e - j d 2 b u - k 2 π T b 2 . Y u = S u H u = 1 T H u e j d 2 b u 2 ∑ k = - ∞ ∞ X u - k 2 π T b e - j d 2 b u - k 2 π T b 2 , u ≤ σ M .
S ˜ I , T s M w s = X ˜ I , T s w s H ˜ w s = 1 T H ˜ w s e j d 2 b w s N 2 T 2 ∑ k = - ∞ ∞ X w T s M - k 2 π T b e - j d 2 b w s N - k 2 π b 2 T 2 . Y u = T s M S ˜ I , T s T s M u = T s M T H ˜ T s M u e j d 2 b u 2 ∑ k = - ∞ ∞ X u - k 2 π T b e - j d 2 b uT - k 2 π b 2 T 2 , u ≤ σ M .
or equivalently H ˜ w = 1 T s M H w T s M , w ≤ π b . In Figures 1a and 2a, the whole processing is performed in the continuous-time domain, whereas in Figures 1b and 2b, most of the processing is performed in the discrete-time domain. The sampling identity and the interpolation identity establish an equivalence between a continuous-time filtering and a discrete-time filtering involving sampling rate conversion in the LCT domain. In subband coding for speech and image signals, it is possible to compress the signal by the filterbank for bandlimited signals in the FT domain. However, we may encounter signals that are not bandlimited in the FT domain but bandlimited in a LCT domain. In this case, we need to use the filterbank in the LCT domain to perform the subband coding. In  and , the Papoulis' multichannel sampling theorem has been extended for bandlimited signals in the FRFT domain and the LCT domain, respectively. To illustrate the utility of the derived identities, we apply them to obtain an efficient discrete-time reconstruction method for the multichannel sampling pattern in the LCT domain in this section. By employing the sampling and interpolation identities for bandlimited signals in the LCT domain, a continuous-time LCT filterbank, which corresponds to a certain multichannel sampling scheme, can be converted to an equivalent discrete-time LCT filterbank and vice versa. where z k t = y k t e - j a 2 b t 2 . Let F k M u = e - j d 2 b u 2 L M z k u . Then, the reconstruction formula (23) can be achieved via a continuous-time synthesis filterbank that is shown in Figure 3. Reconstruction of bandlimited signals from multichannel samples in the LCT domain. Here, the filtering function F k M u denotes the convolution in the LCT domain with the parameter M rather than the conventional Fourier convolution. It should be pointed that the filters H k M u are general, but not entirely arbitrary. They must meet the condition that the reconstruction function y k (t) is a solution of the system . Similar condition holds for the filters F k M u . 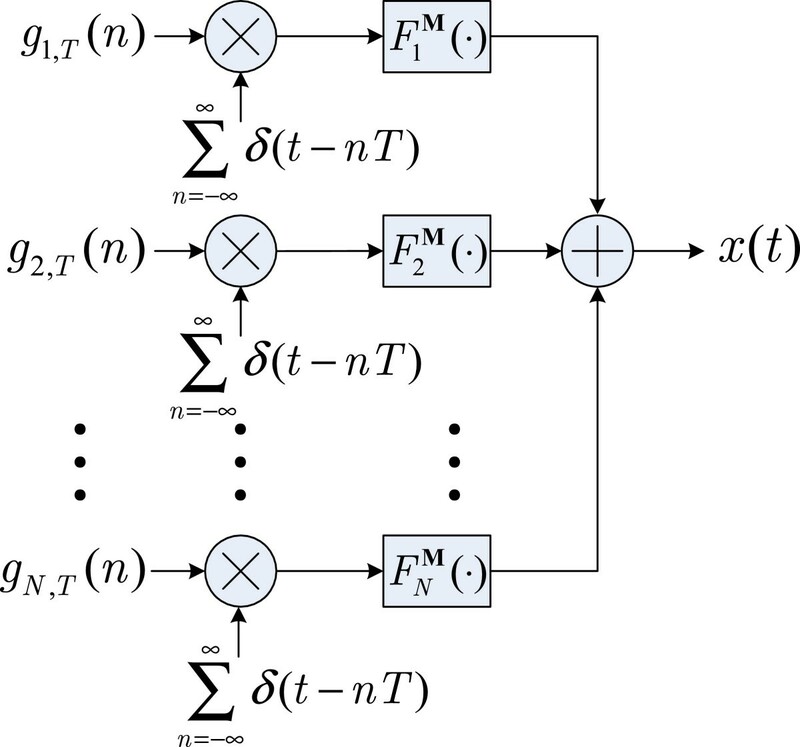 Applying the interpolation identity to each branch in Figure 3 and moving the term ∑ n = - ∞ ∞ δ t - n T s and lowpass filter H LP M u outside the summation for each branch, we can obtain the equivalent implementation shown in Figure 4. Reconstruction from multichannel samples using the discrete-time LCT filterbank. The discrete-time filters F ˜ k M w with the expansion operations construct a discrete-time synthesis filterbank or a multirate filterbank in the LCT domain, which can be performed very efficiently (e.g., utilizing the polyphase structure ). Since the Papoulis' multichannel sampling theorem is a unified framework for linear filtering operations prior to sampling and the LCTs are a family of integral transforms, reconstruction processes for bandlimited signals in the corresponding transform domain (special cases of the LCT domain) from certain multichannel samples can be efficiently implemented in a similar way. As the case in the Fourier domain, multichannel sampling for bandlimited signals in the LCT domain can be understood by relating the sampling and reconstruction schemes to the continuous-time analysis/synthesis filterbank system in the LCT domain. Both the LCT continuous-time and discrete-time filterbanks are related to perfect reconstruction (PR) of the original bandlimited signal in the LCT domain, with one in the continuous-time domain and the other in the discrete-time domain. Utilizing the sampling identity and the interpolation identity associated with the LCT, we can convert a continuous-time LCT filterbank to an equivalent discrete-time LCT filterbank preceded by a Nyquist rate sampling and followed by an impulse train multiplication and a lowpass filter in the LCT domain, and vice versa. 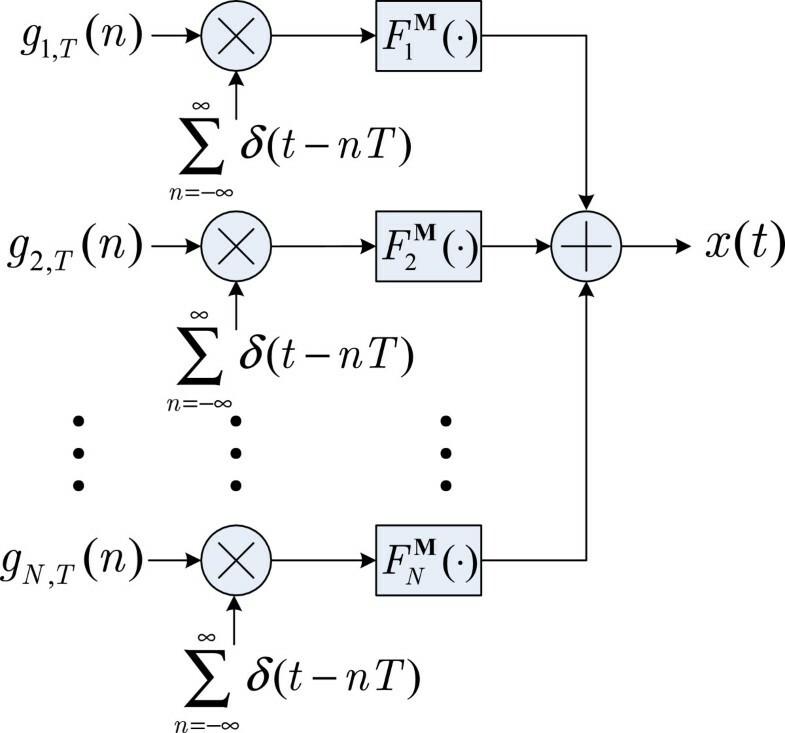 For example, the discrete-time LCT filterbank implementation of multichannel sampling and reconstruction for bandlimited signals in the LCT domain is shown in Figure 5. This relationship also helps us derive new sampling schemes. We can obtain new sampling and reconstruction processes from a PR LCT multirate filterbank by converting it to a continuous-time LCT filterbank. Discrete-time LCT filterbank implementation of sampling and reconstruction processes for bandlimited signals in the LCT domain. This paper investigates the relationship between the multichannel sampling theorem for bandlimited signals in the LCT domain and the LCT multirate filterbanks. Two identities for bandlimited signals in the LCT domain are firstly presented and then applied to obtain the discrete-time implementation for multichannel sampling based on the LCT. Through the use of the sampling and the interpolation identities associated with the LCT, we establish a relationship between the continuous-time LCT filterbank and the discrete-time LCT filterbank. New sampling strategies based on the LCT can be obtained using these identities. Since the discrete-time filterbank can be implemented efficiently (e.g., using the polyphase structure), the sampling and reconstruction processes can be realized efficiently. This work was supported in part by the National Science Foundation of China for Distinguished Young Scholars under grant 60625104, by the National Natural Science Foundation of China under grant 61201354, by the Basic Science Foundation of Beijing Institute of Technology under grant 20120542005, and by the National Key Basic Research Program Founded by MOST under grants 2009CB724003 and 2010CB731902.